John Speir Heron, pre 1890-Jun 1912, Castle Hill/Sydney/New South Wales/Australia, Purchased by JS Heron (1872–1951)'s grandfather in England in the mid 19th century. Heron brought the painting to Australia circa 1890 when he migrated with his widowed mother Edith Pape Heron (1852–1908). The painting was on loan to the Gallery c1905. Heron gifted the painting to the Gallery in 1912 as 'being the most suitable resting place for it and as a memento of the fact that the wreck of the 'Pericles' involving a loss close in a million sterling in property, was unattended, mercifully, by any loss of life' [JS Heron's letter to AGNSW 8 Jan 1912, AGNSW archives]. E McN, Sydney Morning Herald, no 32067 , 'Salvaged from the sea', Sydney, 08 Oct 1940, p 15. Tiepolo, the complete paintings , New York, 2002, p 230, no 103/18, illus p 231. As 'St Roch sitting, turned to the left'. Giambattista Tiepolo, i dipinti, opera complete , Venice, 1993, np, no 202, illus np. European Paintings before 1800 in Australian and New Zealand public collections , Sydney, 1989, p 95, no 281, illus p 95. L'opera completa di Giambattista Tiepolo , Milan, 1968, p 97, no 77P, illus p 76. 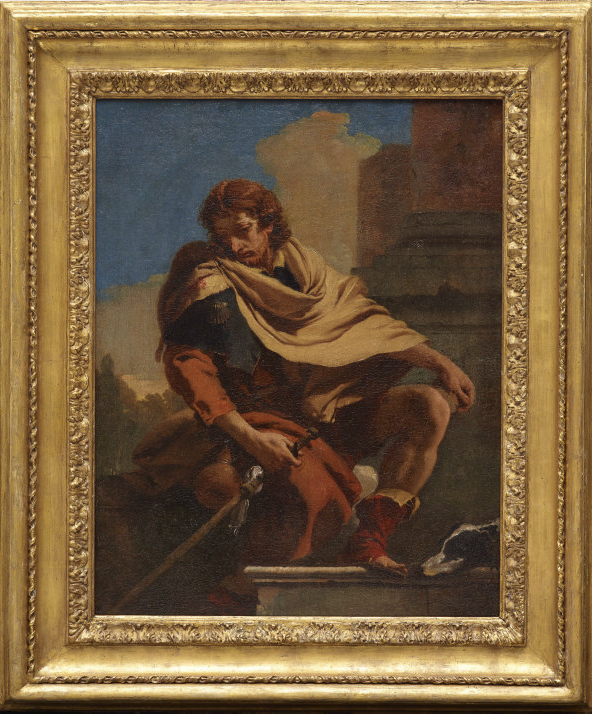 A complete catalogue of the paintings of G B Tiepolo, including pictures by his pupils and followers wrongly attributed to him , London, 1962, p 50, fig 162, illus np. Illustrated souvenir: eighty-two reproductions from the collections of the Art Gallery of New South Wales: a selection of eighty-two reproductions mainly from the Australian collection and including examples from the British, French and Dutch , Sydney, circa 1958, p , no 45. Illustrated souvenir: eighty reproductions from the collections of the National Art Gallery of New South Wales: a selection of eighty reproductions mainly from the Australian collection and including examples from the British, French and Dutch , Sydney, [circa 1950], np, no 45. The Daily Telegraph, vol X, no 275 (new series) , 'Picture of the month exhibitions at Gallery", Sydney, 07 Feb 1946, p 11. Sydney Morning Herald, no 33735 , '"Discoveries" at Art Gallery', Sydney, 06 Feb 1946, p 5. The Daily Telegraph, vol X, no 273 (new series) , 'Old master in vaults', Sydney, 05 Feb 1946, p 1, illus p 1. Sydney Morning Herald, no 33721 , 'Art Gallery Gifts', Sydney, 21 Jan 1946, p 5. The Herald, no 19169 , '"It may be valuable" – But, usually, it isn't', Melbourne, 25 Oct 1938, p 6. The Evening News, no 3627 , 'Sydney's Tiepolo', Rockhampton, 17 May 1933, p 3. The Sunday Mail, no 520 , 'Found after wreck', Brisbane, 14 May 1933, p 5. The Daily Telegraph, vol 3, no 75 , 'Sydney's Tiepolo - or is it a Salvatore Rosa? ', Sydney, 13 May 1933, p 7. Trustees of the Art Gallery of New South Wales: Minutes 25.5.1923-28.11.1929 , Sydney, 1923-1929, p 871 (17 Dec 1926). Trustees of the Art Gallery of New South Wales: Minutes 25.5.1923-28.11.1929 , Sydney, 1923-1929, p 822 (9 June 1926). Letter from Christie's London regarding identification of pictures. The National Art Gallery of New South Wales: Illustrated Catalogue 1925 , Sydney, 1925, p 75, no 227. As 'The weary pilgrim'. Unidentifed. Reprint 1926 (p 75, no 227); 1928 (p 82, no 237, as Tiepolo). Trustees of the Art Gallery of New South Wales: Minutes 25.5.1923-28.11.1929 , Sydney, 1923-1929, p 744 (23 Oct 1925). Pictures proposed to send to London for identification. National Art Gallery of NSW illustrated catalogue , Sydney, 1924, p 73, no 231. As 'The weary pilgrim'. Unidentified. National Art Gallery of NSW illustrated catalogue , Sydney, 1921, p 64, no 33. As 'The weary pilgrim'. Unidentified. National Art Gallery of NSW illustrated catalogue , Sydney, 1918, p 66, no 77. As 'The weary pilgrim'. National Art Gallery of New South Wales (report of the trustees for the year 1912) , Sydney, 1913, p 2. Trustees of the Art Gallery of New South Wales: Minutes 27.3.1903-25.8.1909 , Sydney, 1903-1909, p 216 (26 May 1905). Loan offered. 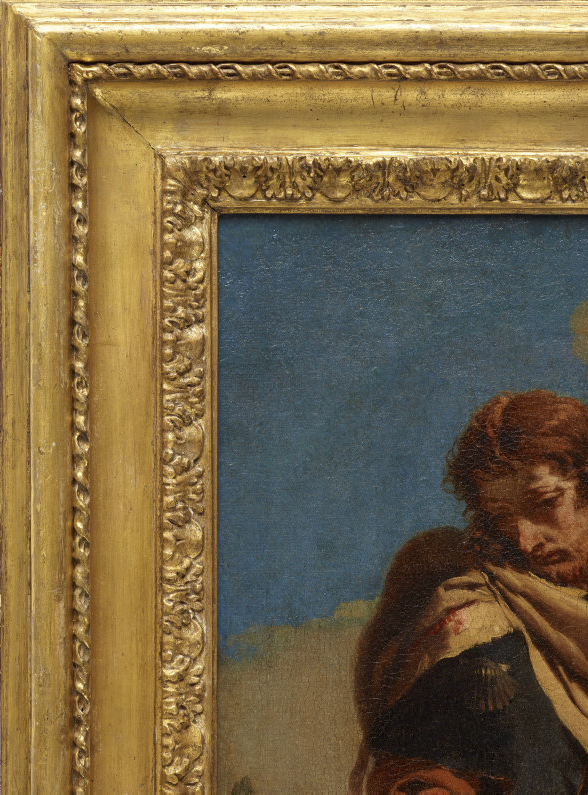 "The Weary Pilgrim" Salvator Rosa by Mr E P Heron. Accepted for 3 months. [The painting was on loan until June 1906]. Trustees of the Art Gallery of New South Wales: Minutes 27.8.1909-28.4.1916 , Sydney, 1909-1916, p 187 (19 Jan 1912). Presentation offered. By J S Heron. 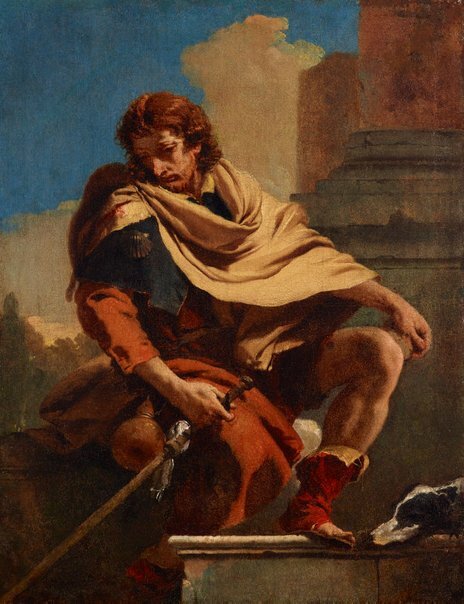 The Weary Pilgrim (oil painting) Salvator Rosa. Accepted with thanks. AGNSW archive 13/1912 , 08 Jan 1912. Presentation of 'The Weary Pilgrim" to the AG following wreck of the Pericles and restoration of the picture. The Herald, no 17446 , 'Self-portrait – Trustees Consider Purchase – Tiepolo work, too', Melbourne, 13 Apr 1933, p 1. 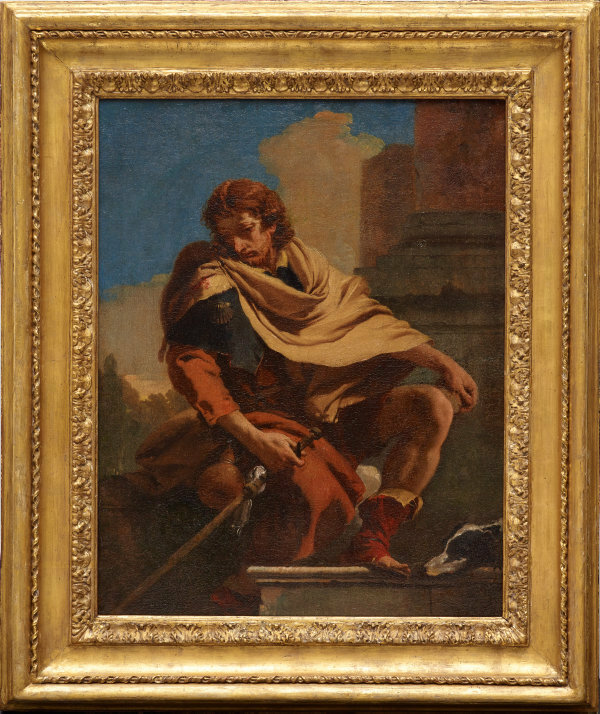 Giambattista Tiepolo: fifteen oil sketches , 2005, p 42, fig 5.2, col illus p 42. The Townsville Daily Bulletin, vol LXVII , 'Old master found in vaults', Townsville, 08 Feb 1946, p 1, illus p 1.